The concept of mounting a heavy infantry gun on a tank chassis was born out of the need for providing the German infantry formations with more mobile artillery support. The 15cm sIG 33 (Sf) auf Panzerkampfwagen I Ausf. B was the first attempt to test the performance of this concept. In essence, it was simply the mounting of a heavy 15cm sIG 33 on the Panzerkampfwagen I Ausf. B chassis. It was built in small numbers but this vehicle saw extensive combat in France, the Balkans and later on the Eastern Front up to 1943. During the First World War, the need for more mobile infantry support artillery became obvious. In countless attacks, especially on the Western front, infantry units (on both sides) found themselves in situations where the lack of proper artillery support prevented them from capturing enemy trenches and positions. 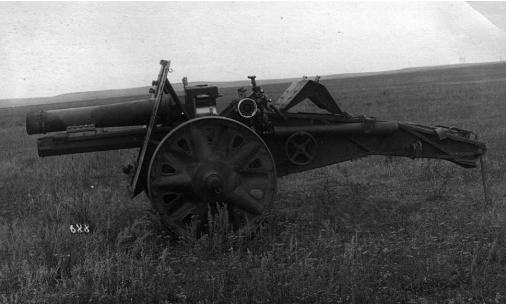 The existing field guns were often too heavy or had insufficient mobility to be used more directly during assaults. After the First World War (in the late twenties and early thirties), the Germans developed new infantry support guns. The lightweight 7.5 cm LeIG 18 and the heavier, larger caliber 15 cm sIG 33. The 15 cm sIG 33 proved to be especially effective in combat. It had good elevation, was easy to maintain, and had excellent firepower. However, the biggest issue with the design was its heavy combat weight, which limited its mobility. This became obvious during the invasion of Poland in 1939. A solution to this problem was to mount this weapon on a more mobile platform to give it more mobility. As the Panzer I tank was obsolete, the Waffen Prüfen 6 (Wa Prüf 6 – design office for armored vehicles and other military equipment) decided to reuse the chassis and mount the heavy 15 cm sIG 33 on it. In January 1940, the first prototype was built by the Altmärkische Kettenwerke G.m.b.H (Alkett) in Berlin. As this design was deemed satisfactory, an additional 37 vehicles were converted within a short time and, by March 1940, all were ready for combat operations. These vehicles, including the single prototype, would be readied for the upcoming German invasion of France in May 1940. The official name of this vehicle was ‘15cm sIG 33 (Sf) auf Panzerkampfwagen I Ausf. 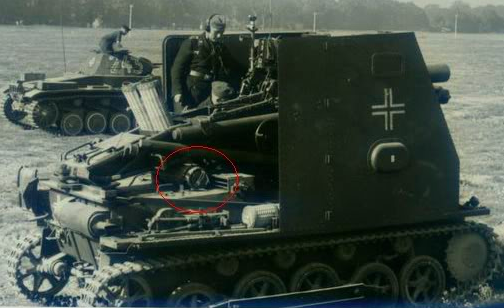 B’, though in some sources ‘15cm sIG 33 (Sf) auf Geschuetzwagen I Ausf. B’ is used. The abbreviation ‘Sf’ stands for ‘Selbstfahrlafette’, which can be translated as ‘self-propelled’. Additionally, the name ‘Bison‘ is often associated with this vehicle. Many other German WW2-era vehicles acquired similar wrongly attributed nicknames in the post-war era (like ‘Hetzer’ or ‘Gepard’), which were never used by the Germans during the war. 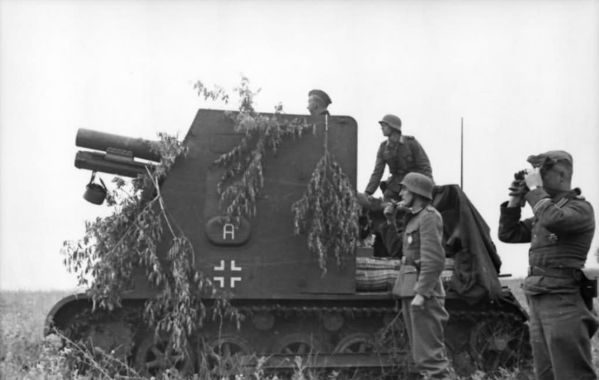 Sturmpanzer I’ is another false name, given in the incorrect belief that the vehicle was designed to be used as a direct firing support weapon, which did occasionally happen but was not its primary purpose, due to the low armor thickness and the fact that is was not fully protected. Note: For the sake of simplicity only, this article will use the sIG 33 auf Pz. I name, although this is not an official name. The 15 cm s IG 33 was designed in 1927 primarily for use as an infantry support weapon. With a total weight of approximately 1.700 kg, it was one of the heaviest guns ever to be used for such a purpose. It was a reliable and robust gun that was easy to build and required very little maintenance. In terms of construction, it was quite a conventional design: a two-wheeled carriage (the wheels were made from pressed metal and fitted with solid rubber tyres when intended for motorised towing) and the older type of box-trail equipped with a hydropneumatic recoil system placed under the gun barrel. The gun possessed a high elevation and used a horizontal sliding-block breech mechanism. To help counteract the muzzle weight, two spring balancing-presses (one on both sides) were installed. The elevation was -4° to +73° with an 11° traverse. Muzzle velocity was between 240-280 m/sec depending on the type of ammunition used. Maximum firing range was 4,700 m. The standard HE ammunition used was the 15 cm l Gr 38 Nb (38-40 kg). Rate of fire was low, at only 2 to 3 rounds per minute. This was due to the heavy weight of the shells and the use of separate two-part ammunition (shell and charges). It was considered a satisfactory weapon by the Germans, but the greatest issue was its weight. It would remain in use throughout the whole of World War II, in both its original form and as the main weapon of many German self-propelled guns. For the sIG 33 auf Pz. 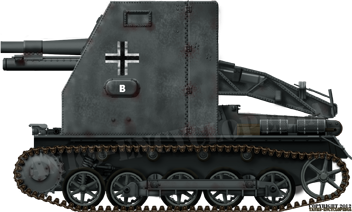 I modification, the Panzer I Ausf. B chassis was used, as it had a stronger engine and was longer than the Ausf. A. The sIG 33 auf Pz. I’s suspension and running gear were the same as those of the original Panzer I Ausf. B, with no change to its construction. It consisted of five road wheels on both sides. The first wheel used a coil spring mount design with an elastic shock absorber in order to prevent any outward bending. The remaining four wheels were mounted in pairs on a suspension cradle with leaf spring units. There were two front drive sprockets, two rear idlers and eight return rollers in total (four on each side). The design of the rear engine compartment was left unchanged. The main engine was the water-cooled 3.8 l Maybach NL 38 TR, with 100 hp at 3,000 rpm. The fuel consumption was around 149 l at 100 km. The gearbox (ZF Aphon FG 31) had five forward and one reserve speed. While the chassis remained unchanged, the original superstructure and turret were completely removed. In their place, a simple three-sided (open from the back and the top) box-shaped armored superstructure was added for crew protection. The upper front part of this new compartment was open (U-shaped) to allow the gun to be placed there. Besides the front armored plate, the gun shield also protected the crew. The rear sections of the two side walls could, if needed, be opened to provide the crew with more working room and some protection during ammunition resupplies. 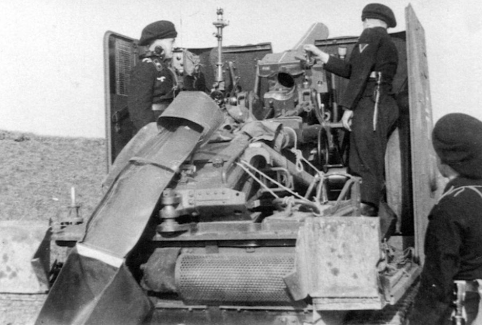 Three observation ports were incorporated into this armored box: two at the sides and one at the front left side. The unchanged Panzer I Ausf. B chassis had 13 mm of all-around armor, while the floor and hull roof were 6 mm thick. The new box shaped superstructure was 10 mm thick on all three sides. It was built by a combination of riveted and welded plates. The main gun was the 15 cm schweres Infanterie-Geschütz 33, often shortened to 15 cm sIG 33. This gun was not modified in any way and was simply placed on top of the modified tank chassis. The wheels were held in place (preventing them from moving during firing) by reinforced metal plates located on top of the mudguards. The gun was also secured by a vertical pin connected to the gun tow hitch (towing eye) and a triangular shaped armored plate that was welded to the engine compartment. If needed, the gun could be easily removed, which made performing maintenance and repairs much simpler. For this purpose, on both sides of the armoured superstructure there were two oval projections. The right-hand side oval was slightly closer to the front of the vehicle, in contrast to the left side. This allowed the gun to be turned anti-clockwise and with the help of some kind of crane or a winch system, the gun could be removed without dismantling the rest of the superstructure. The main gun elevation was -4° to +75 (or 0° to + 73° according to some sources) with a traverse of 11° (some sources state 10° or 12°). Due to its cramped interior and the large ammunition required for the gun, according to most sources, only three rounds were carried inside the vehicle. There are photographs that show that an additional fourth round was carried under the gun itself, making it difficult to spot. Spare rounds were held in woven containers. Two were usually located on the left rear mudguard and one on the right side, plus the one under the gun. It was also possible for crews to store many additional rounds in any available free space inside the vehicle. Besides the crew’s personal weapons, no secondary armament was provided for self defense. As this vehicle was designed to fire from a distance, this was not a significant issue. The weight was increased to nearly 8.5 t compared to the original 5.8 t weight of the Panzer I Ausf. B. As far as the dimensions of the vehicle are concerned, most sources often quote these figures: length 4.67 m, width 2.06 m, height 2.8 m. According to some other sources, these dimensions were: length 4.42 m, width 1.68-2.65 m and height 3.35 m.
The crew consisted of a commander (who was also the gunner), two loaders (necessary due to the heavy weight of the 15 cm rounds), and the driver. The driver’s position was on the vehicle’s left side, the same as on the original Panzer I, but the front superstructure was changed with the addition of an extra vision port on the right side. Although the driver was therefore fully protected, the remaining crew members only received partial protection from the added armor plates. The commander, who also served as the gunner, was located on the gun’s left side. For viewing his surroundings and spotting potential targets, the Zeiss Rblf 36 sight was used. The loaders were frequently exposed to enemy fire, as they often had to move between the sIG 33 auf Pz. I and its ammunition supply vehicles due the vehicle’s low ammo count. One loader would load the gun while the other would bring new shells. The crews from the supply vehicles (usually three people per vehicle) would also help with delivering the ammunition. Because of this, sometimes the crew number is stated as larger than four. As there was little room for all of the crew members, on longer marches, the crew, with exception of the driver, were usually transported by the support vehicles (but this depended on the situation in the field). As an open-topped vehicle, the crew was also exposed to the weather. A canvas cover could be placed over the vehicle, but it limited the crew’s view of the surroundings. 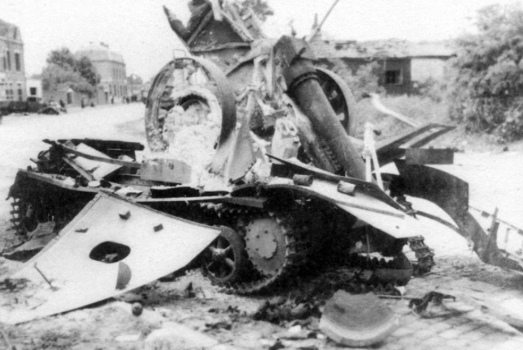 Very often, additional spare parts, such as wheels and tracks, would be added to the front armor. This had a dual function; first it helped to quickly repair broken parts, and secondly, it acted as extra armor (even though this had a very limited effectiveness). 15cm sIG 33 (Sf) auf Geschüetzwagen I Ausf B (Bison) Sd.Kfz.101 of the schwere Infanteriegeschütz-Kompanie 701, France, May 1940. 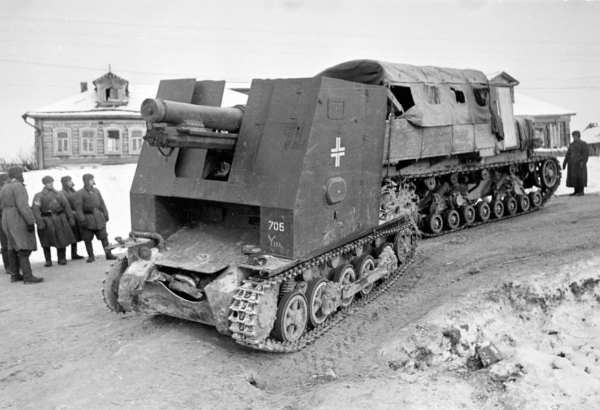 15cm sIG 33 (Sf) auf Geschüetzwagen I Ausf B (Bison) Sd.Kfz.101 of unit 704, attached to the 5th Panzerdivision. Both illustrations were produced by Tank Encyclopedia’s own David Bocquelet. Prior to the beginning of the Second World War, ordinary German infantry divisions contained a number of 15 cm caliber guns available in their organisational structure. For Motorized Divisions, the situation was different. For artillery support, 75 mm caliber guns were mostly used, as the 15 cm guns had low mobility and there were insufficient numbers of adequate transport vehicles. During the German invasion of Poland in 1939, the Motorized Infantry Division lacked necessary heavy artillery support. The German solution to this problem was the introduction of the sIG 33 auf Pz. I. It had enough firepower and far greater mobility than towed guns. Of the 38 converted, two were used as training (and as replacement for any lost vehicles), while the rest were used to equip six self-propelled heavy infantry gun companies (Schwere Infanteriegeschütz (Motorisiert) Kompanie, s.I.G.(mot.) Kp for short. These were numbered from 701 to 706. These companies consisted of a command unit (Kompanietrupp) that was equipped with four military cars (with better off-road performance) such as the Kfz. 15 Horch, as well as four motorcycles (usually one with a sidecar). Each company was then divided into three platoons, each with two sIG 33 auf Pz. I vehicles, four Sd.Kfz.10 half-track vehicles (with two trailers) and two motorcycles. As there was limited space inside the vehicle, the crew and the additional ammunition would be transported in these half-tracks. These companies also included an ammunition transportation unit (Munitionsstaffel), consisting of three 3 ton trucks, a smaller supply unit (Verpflegungstross) with one 1.5 ton truck and a motorcycle, and one maintenance and repair unit with one car and a motorcycle. In total, it comprised some 176 soldiers and officers. In February 1941, these self-propelled heavy infantry gun companies were reorganized. The major change was the introduction of a unit equipped with radio equipment. Although photographic some sIG 33 auf Pz. I were equipped with antenna mounts and radios, this still represented a considerable improvement in communications capabilities. 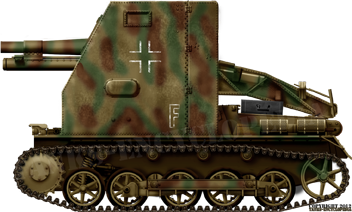 As previously noted, the sIG 33 auf Pz. I was used to equip several self-propelled heavy (motorized) infantry gun companies numbered from 701 to 706. These were allocated to six Panzer divisions which were preparing for an attack on the Western Front in May 1940. The 701st was given to the 9th Panzer Division, 702nd to the 1st Panzer Division, 703rd to 2nd Panzer Division, 704th to the 5th Panzer Division, 705th to the 7th Panzer Division and the last, the 706th, was given to the 10th Panzer Division. During the German offensive on France, it proved to be an effective weapon but was not without its flaws. The mobility (compared to towed guns) and the firepower were assessed as positive, but mechanical breakdowns, especially on the transmission, were common, and many vehicles were put out of action because of this. For example, the 703rd company had only one operational sIG 33 auf Pz. I after the first week of fighting. Only two were lost due to enemy fire during this offensive. One of these two was hit by an artillery shell and destroyed. The effectiveness of its firepower can be seen in a contemporary German propaganda video, where it is filmed destroying a house during one German offensive action (possibly somewhere in France). This video shows that the sIG 33 auf Pz. I was sometimes (depending on the combat situation) used in a more direct support role. Due its weak armor this kind of sIG 33 auf Pz. I usage was very dangerous for its crew. The link for this video can be found here. During the Axis invasion of Yugoslavia in April 1940, and later the invasion of Greece, some Panzer Divisions (the 2nd, 5th and the 9th) equipped with sIG 33 auf Pz. Is were involved in these operations. Yugoslavia was overtaken very quickly (the war lasted less than two weeks), with minimal German losses. Following the capitulation of Yugoslavia, the Germans successfully invaded Greece. There is no information as to whether these units suffered any losses, but it is likely none were lost. After a successful campaign in the Balkans, the Germans began to withdraw their forces in preparation for the upcoming attack on the Soviet Union. The 703rd company, together with other armored vehicles of the 2nd Panzer Division, was to be transported by the ships Kybfels, Laura C and Marburg from Patras to Taranto (Italy). But on the 21st of May 1941, all sIG 33 auf Pz. Is belonging to the 703rd company were lost, as the Marburg and Kybfels were sunk by a naval mine near Kephalonia island. By the end of August this unit was equipped with towed 15 cm sIG 33. All six self-propelled heavy infantry gun companies (the 703rd had no sIG 33 auf Pz. I vehicles but it participated in this attack) were ready for Operation Barbarossa, the German invasion of the Soviet Union, in June 1941. Although the German forces did not expect any serious resistance from the Soviet Army, the first month of the invasion proved to be different from their expectations. All six self-propelled heavy infantry gun companies were heavily engaged in combat. Due to many factors (poor roads, mechanical breakdowns, combat losses etc. ), the number of lost vehicles began to grow from month to month. As only a limited number of such vehicles were ever modified, any lost vehicles were difficult to replace with new ones. However, there is proof that field modifications were sometimes made, like in the case of the 701st company from the 9th Panzer Division. In order to replace their sIG 33 auf Pz. I losses, in February 1942, two 15 cm sIG 33 and five Panzer I Ausf. B tank chassis were supplied to this unit. As this vehicle had a very simple construction, it could be easily completed without the need for complicated tools. The last unit to operate this vehicle was the 5th Panzer Division (704th), which still listed two operational vehicles on 30th June 1943. Only a limited number (some 38) of such vehicles were converted during the first half of 1940. Such a small amount of converted vehicles can be explained by the poor performance of the Panzer I tank chassis. In some instances, a few or possibly five, new conversions were made in the Soviet Union at the beginning of 1942. The sIG 33 auf Pz. I self-propelled gun solved the problem of the low mobility of towed artillery guns. It could engage enemy positions and then disengage, change position, or retreat to safety much faster than towed artillery. The sIG 33 auf Pz. I could keep up with tanks and motorized infantry and could provide them with fast firing support, without losing any time preparing for firing like ordinary towed guns. The firepower of the main 15 cm sIG 33 gun was considered to be satisfactory by the Germans. The sIG 33 auf Pz. I had a very simple design, which allowed for quick and easy repairs and replacement of any damaged or worn out parts. 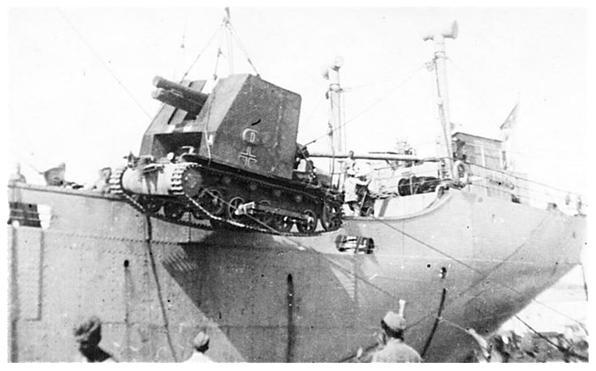 The simple installation of the 15 cm sIG gun also allowed it to be dismounted (if the tank chassis was damaged beyond repair) and to be used as an ordinary towed gun. Although at first glance the sIG 33 auf Pz. I performed relatively well, especially during the battle of France in 1940, many negative issues would be discovered during its service life, especially on the Eastern Front. The weight of the 15 cm gun and the additional armor plates was simply too much for the weak Panzer I tank chassis. This overloading often resulted in many transmission and suspension breakdowns. A common problem was the frequent malfunction of the shock absorbers fitted to the front road wheels. Breakdowns of entire wheels and tracks were also common. The main gun recoil during fire was so strong that the vehicle would wildly shake and could be thrown back. This also increased the chance of damaging the chassis. The extra weight also influenced the engine performance. Fuel consumption was high (149 l per 100 km), which resulted in a limited operational range of only 100 km (or up to 140 km depending on the source). Maximum speed was around 35 km/h on good roads and only 20 km/hr on cross-country. The ground pressure was also very high, which made driving in off-road conditions very difficult. The high profile was a big problem for the sIG 33 auf Pz. I too, making it a good target for enemy artillery gunners. The armor was also quite light and offered only limited protection from small arms fire and shrapnel. But it is also important to note that this vehicle was not designed to be used as an assault weapon. Instead, it was intended to be used in a supporting role from a distance, where the lack of armor was not so important. Regardless, heavy camouflage and a well-selected combat position were necessary for the crew’s survival, but this was not always possible or easy to achieve successfully. Low ammo capacity was a big issue, especially during prolonged fights, as the gun could quickly run out of ammunition, which limited its combat potential. 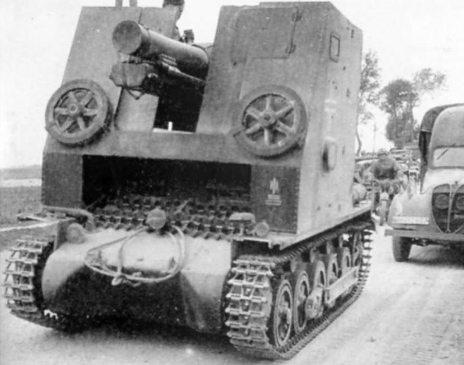 The sIG 33 auf Pz. I therefore needed constant support from a supply vehicle for the delivery of additional ammunition, which were themselves in short supply. Moreover, the crew compartment was too cramped, meaning that some of the vehicle’s crew had to transported by these ammunition vehicles. Despite its flaws, the sIG 33 auf Pz. 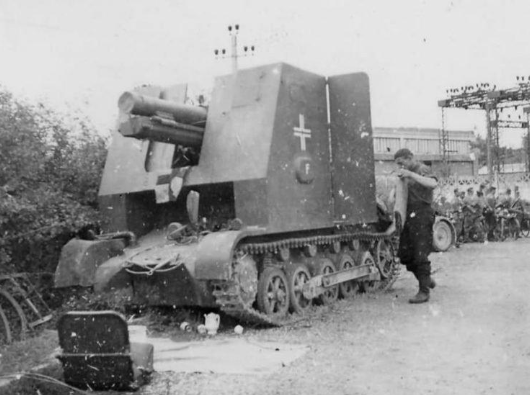 I would become an example how the Germans would (especially in the later part of the war) reuse obsolete or captured tank chassis and combine them with the 15cm sIG gun. Later models would use more fitting tank chassis, such as the Panzer 38(t), which would be built in much greater numbers. The sIG 33 auf Pz. I may not have been a perfect weapon without any flaws, but it influenced the future development of similar vehicles used by the Germans during the war. It not only helped German designers and engineers gain experience in making similar vehicles, but also contributed towards the development of adequate tactics. The author of this article would like to thank Guillem Martí Pujol for providing valuable data. German light and heavy infantry artillery 1914-1945, Wolfgang Fleischer. Encyclopedia of German tanks of world war two, Peter Chamberlain and Hilary L.Doyle. Kraftfahrzeuge und Panzer der Reichswehr, Wehrmacht und Bundeswehr ab 1900, Werner Oswald 2004. Panzer I The beginning of a dynasty, Lucas Molina Franco 2005. The correct name of Italian town is Taranto, not Tarento. Nice article, but a lot of mistakes. 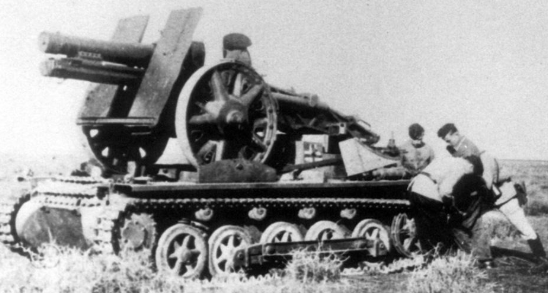 Why didn’t they use a lighter 105 mm howitzer, like on the Wespe? Twice used text was removed by another member. I removed all instances of the Bison name except in the name explanation. Twice used text again removed by another member. Im not a TE staff, nor a expert on tanks, but I can only assume the use of the 15cm gun was by availability of the guns.The 15cm gun, had been in service at 1927. the 105mm, however, was in 1935. Now, common sense would indicate that using the later 10.5cm gun would be a more modern use for such a vehicle, but this is not the case. 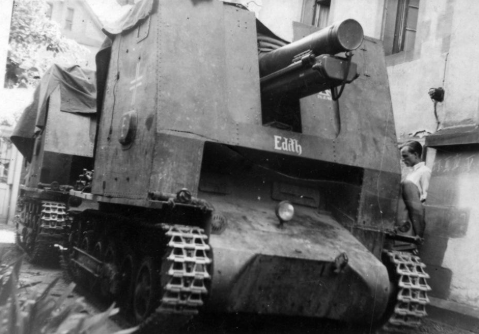 the 15cm gun was used as a heavy infantry gun, and towing those things around was ineffective with keeping up with the tanks, shown in the Invasion of Poland. And true, the 10.5cm gun was lighter, but this would mean that the 15cm infantry gun would be still towed around, and late to get ready. The 10.5cm gun was used as a howitzer, not an infantry gun, and the shells of course wouldn’t be as effective as the 15cm’s shells. So, basically, its all down to the design and purpose of the guns, to be honest. Anyways, I hope you all, viewers and TE crew alike, have a good day, and good days ahead of you. According to our sources, including the highly acclaimed Panzer Tracts series, neither the Sturmpanzer nor the Grille names were ever applied to the 15cm sIG 33 auf Pz.I.